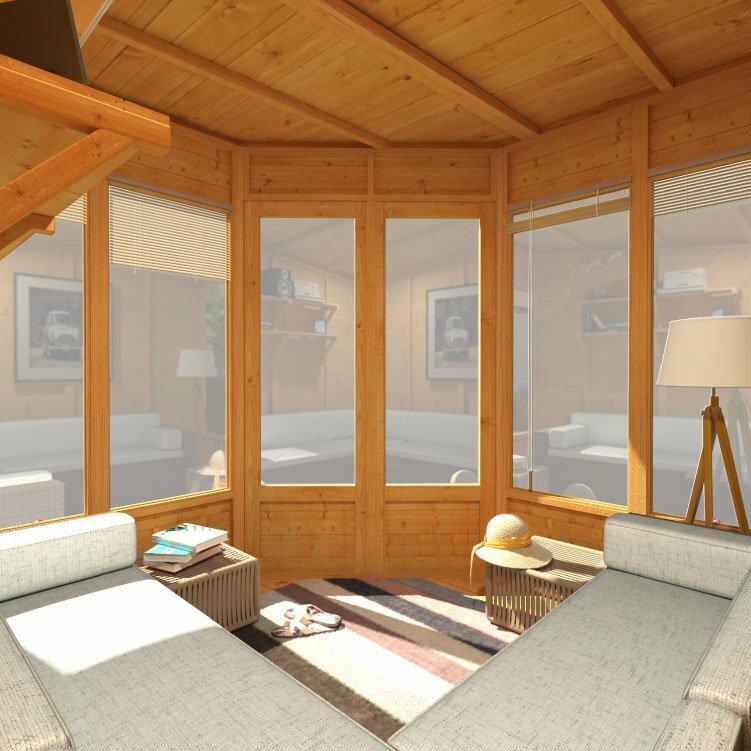 Take a look at the Picton Summerhouse. 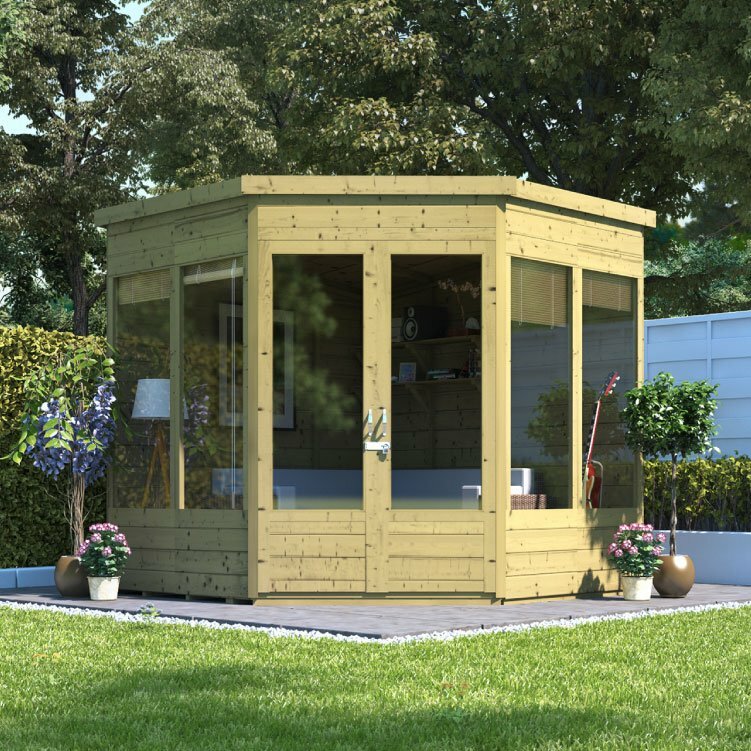 This fantastic summer house design is perfect for smaller, or obscure gardens with the corner style featuring beautiful panoramic windows. Utilising the modern pent design, the Picton maximises headroom, to create an airy luxurious space. Offering a peaceful retreat for those stressful days. 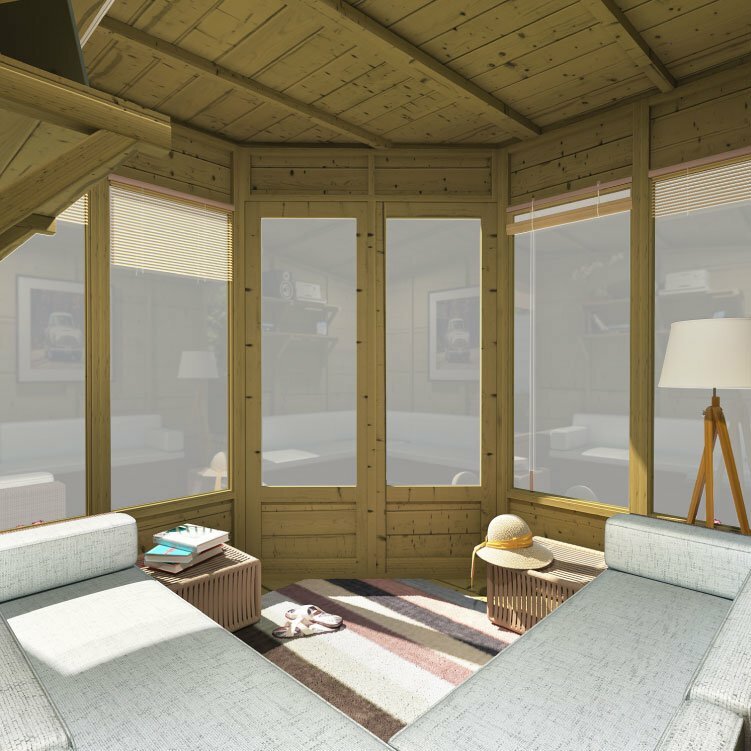 If you want a snug, comfy space to simply enjoy some time to yourself, this is the summerhouse for you. 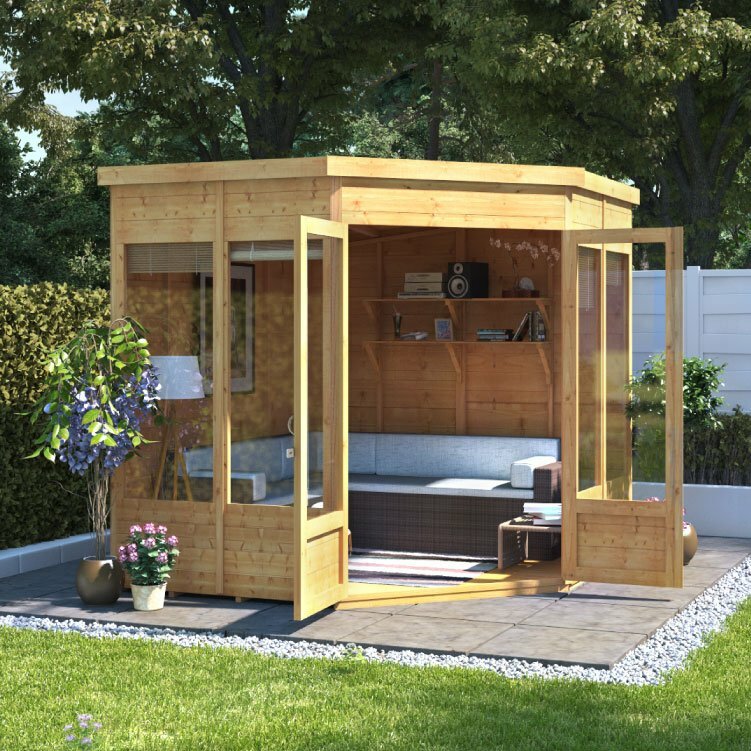 Fitting into your garden corner, the Picton Summerhouse design incorporates a panoramic window and door style. 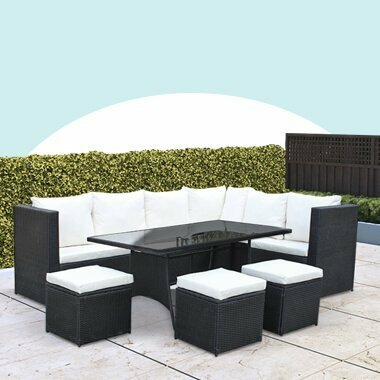 Take in your own garden views all year round and relax in style and comfort. Letting in an abundance of natural light, the Picton is the ideal place to delve into a good book and enjoy the summer rays. Incorporated into the Picton Summerhouse design, is our incredibly popular Tongue and Groove construction. The T&G wooden boards give the corner summer house a classic, authentic, smooth look, perfect for more traditionally styled gardens. 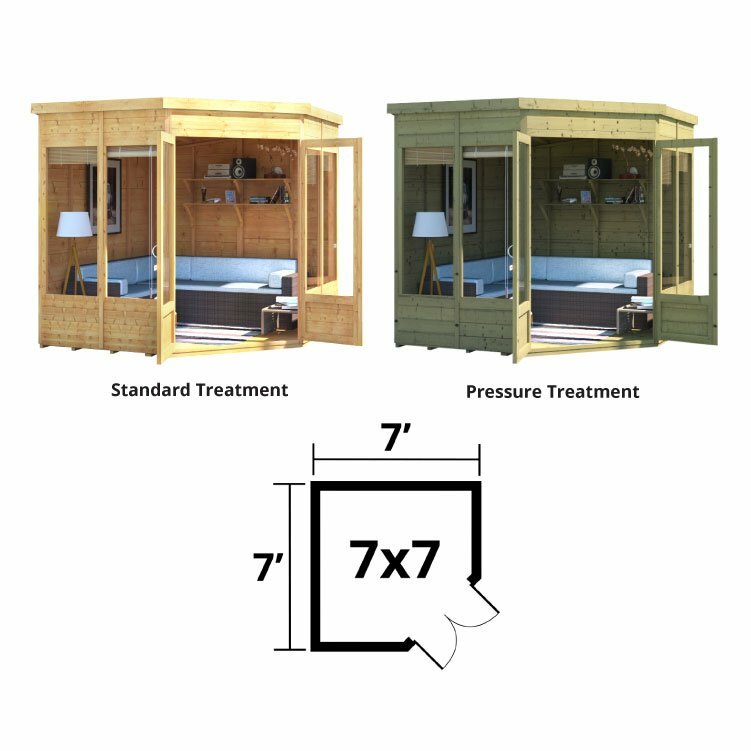 The panels are 11mm thick and interlock together, giving the outdoor garden unit it’s incredible strength. The construction denies any water entry, giving valuable protection against the elements, with the joints well protected against long term issues. The T&G engineering keeps out water--but not moisture. Moisture is the perfect growing environment for moulds. This is why we treat wooden buildings. Taking advantage of the Pressure Treated option with the Picton Summerhouse, coats each wood with treatment not only on the surface area but inside out. 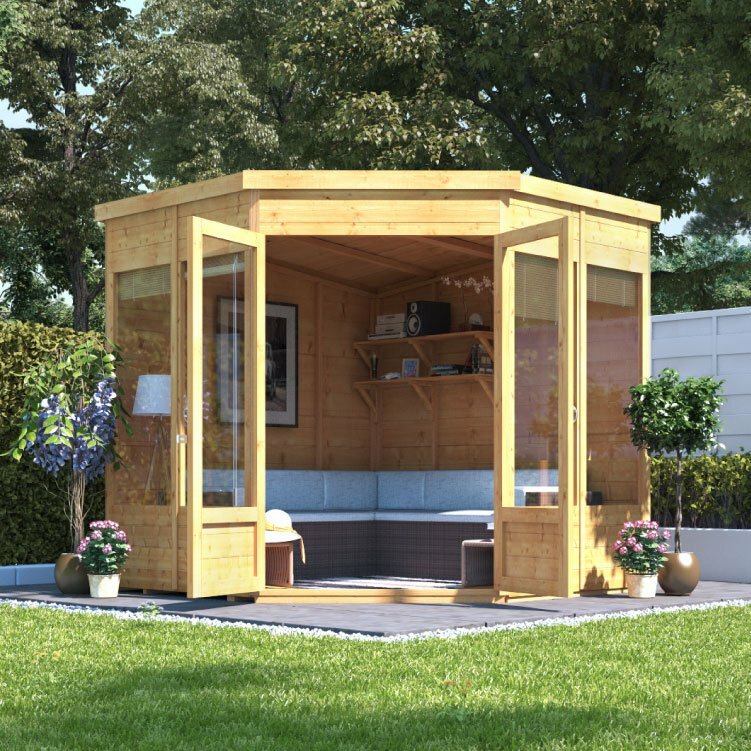 This small corner summer house option is perfect for us who specifically want a building that does not require a lot of maintenance and at the same time save money in the long run. With a contemporary window and door design, the Picton is ideal for modern gardens styles, as you can enjoy the panoramic views of your own garden, all year round. The doors are constructed using a mortise and tenon joint. This creates a strong durable opening, as the joints connect at an angle of 90° to provide the best possible door opening. The windows and doors are glazed using a 1.8mm styrene. As garden space becomes more and more of a premium, finding a quality solution can be an issue. However, our Picton contemporary summer house has been specifically designed to fit directly into a corner. 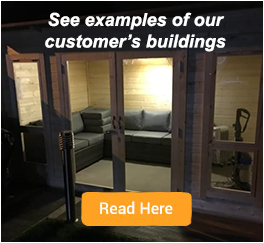 As garden parameters alter, this is the perfect solution, so you don’t have to compromise when it comes to buying a summerhouse and you won’t have any wasted space. 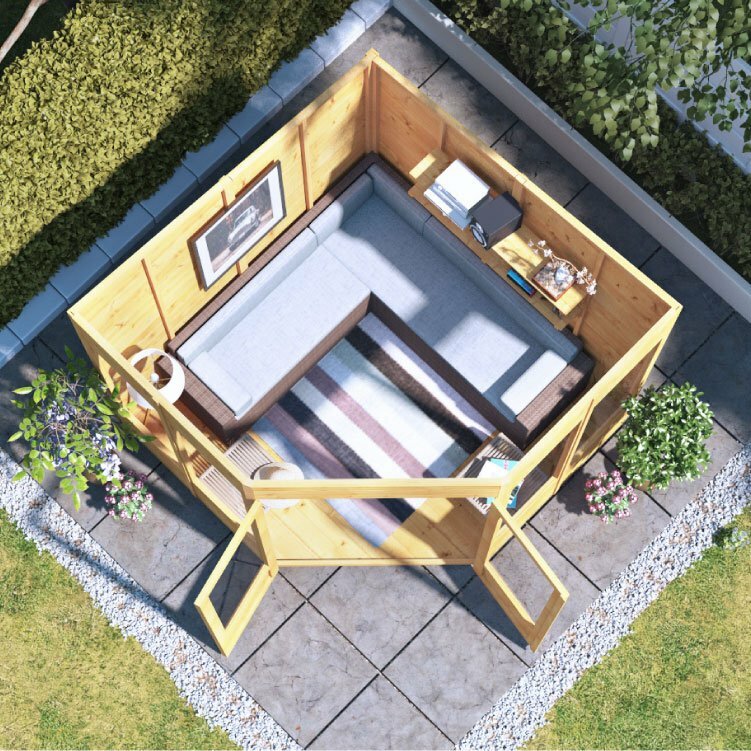 Fitting into small spaces or obscure garden designs, you can enjoy being tucked away and enjoy the comfort of your own summer house. Here at Garden Building Direct, we appreciate that not all gardens are easily accessible, so we want to cut out the hard work for you. 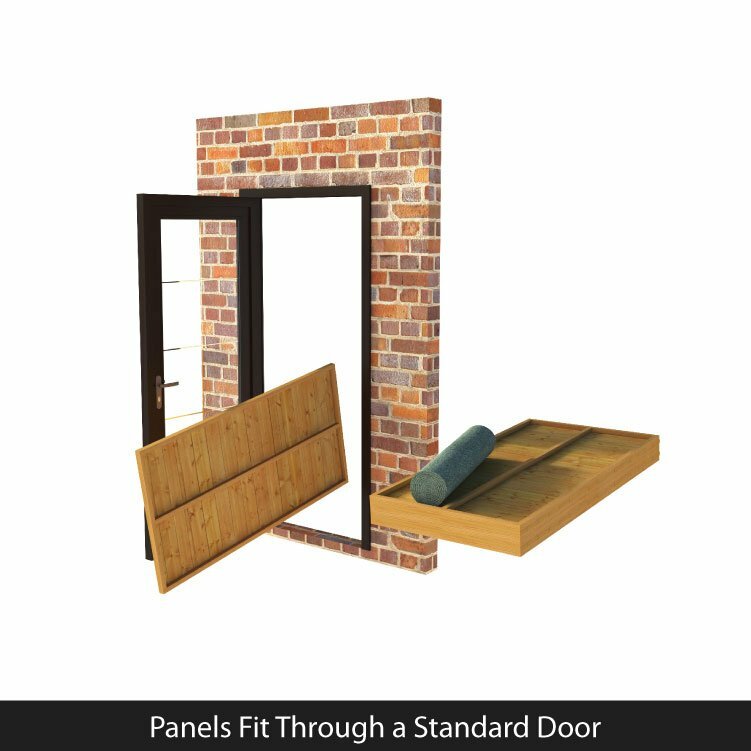 To make handover and delivery as straightforward and simple as possible, each one of our pre-engineered 11mm tongue and groove panels is designed to fit through a standard door. If necessary simply run any boards through your door for minimal fuss and stress. 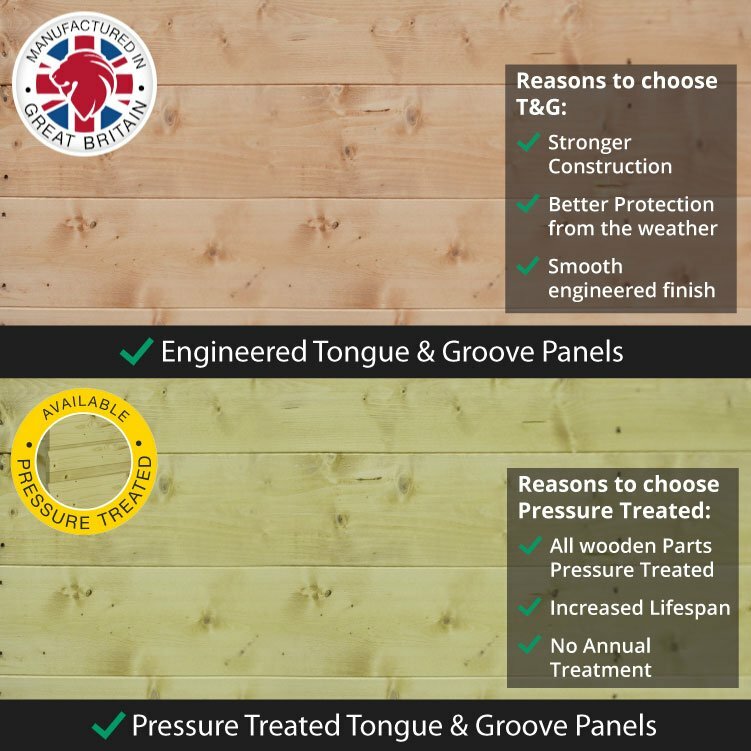 As part of the summer house package, we supply an 11mm tongue and groove floor. This completes the T&G design, giving an all-round smooth finish and design. 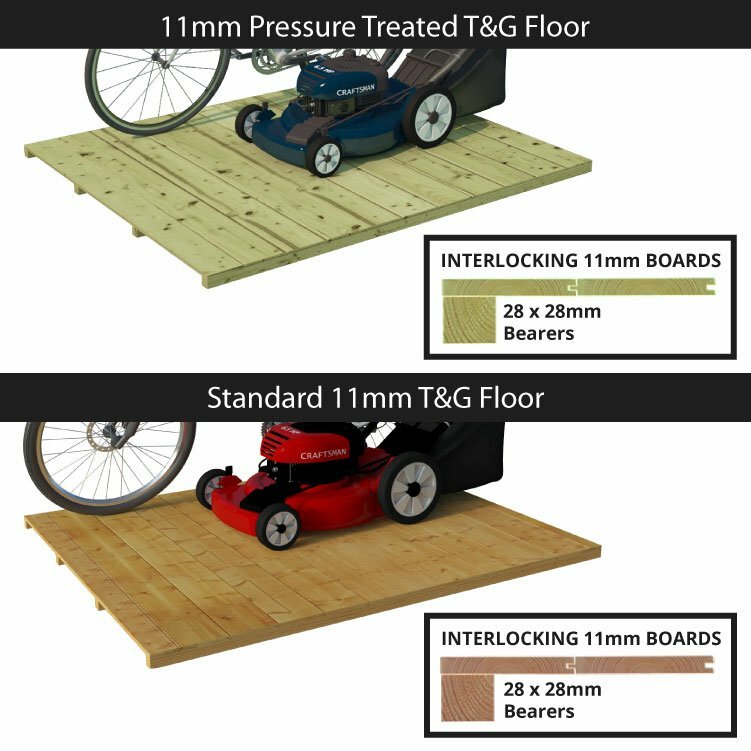 The wooden boards give maximum protection against moisture through the floor, with the panels interlocking together. The hardwearing floor is can withstand all domestic use and provides the perfect platform to create a lavish, comfy space. To provide the best possible construction and protection, the Picton summer house utilises 11mm tongue and groove boards as roofing. This provides fantastic protection against the elements, with the pent design meaning rainwater runs off the back of the building. To maximise the Picton’s headroom, the roof is made out of two T&G panels eliminating the need for any truss and roof support. So there is plenty of light airy space, creating a fantastic space to relax. Experts say that the roof would have to be one of the toughest yet most bombarded sections of the building. 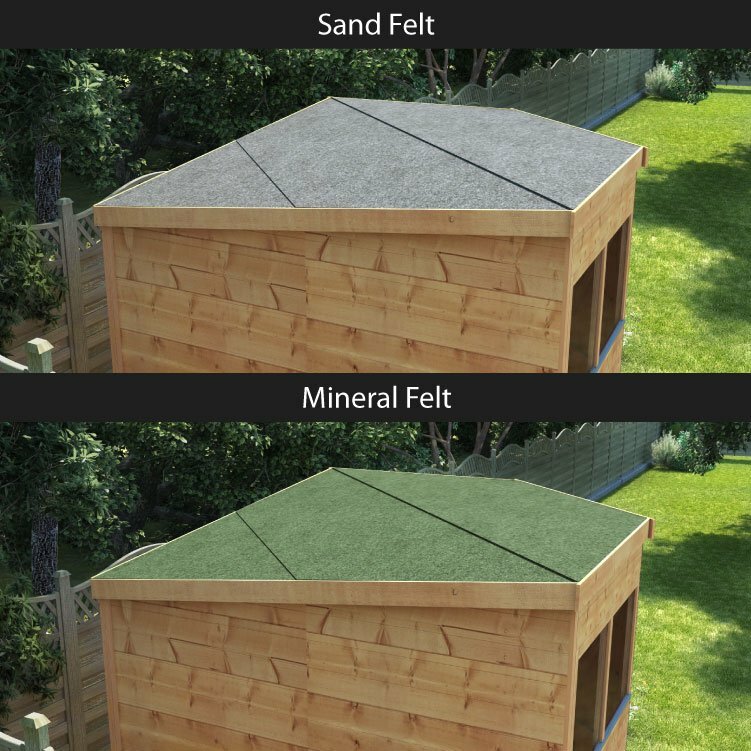 We recommend all our customers to enhance the defensive capability of their roofs further by ordering their Picton small summer house pressure treated. 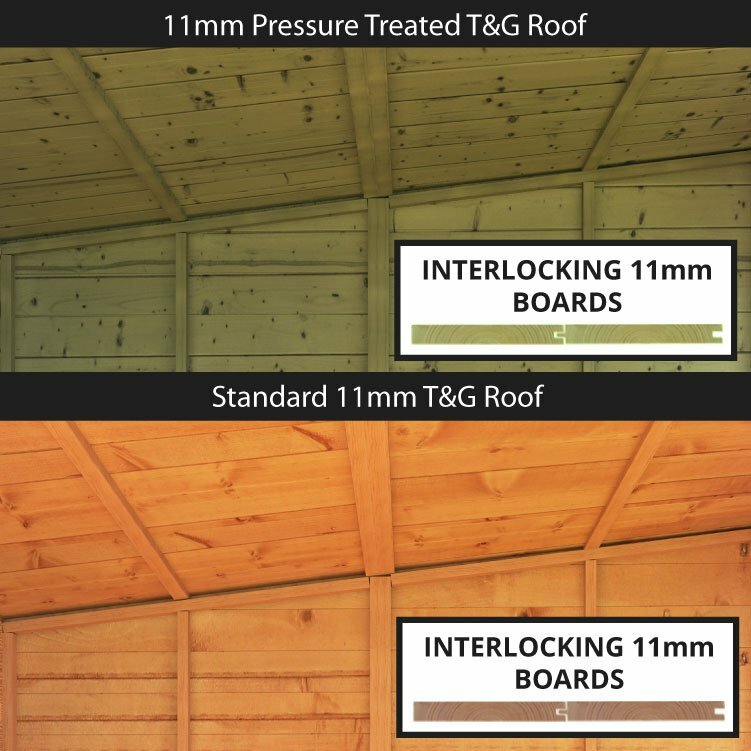 The treatment dramatically increases the durability of your roof and frees you of your maintenance worries. Window Dimensions 53cm x 126.1cm 1'9" x 4'2" 53cm x 126.1cm 1'9" x 4'2"